A Torch for the Path to Omniscience - a commentary on the Longchen Nyingtik Ngöndro by Chökyi Drakpa. "I find the commentary by Chökyi Drakpa to be truly incredible. Whenever I read it I am struck by the fact that absolutely nothing is missing, and that the entire Dharma is included here. Whether you are new to the ngöndro, someone who is more familiar with Vajrayana practice, or even a Dzogchen practitioner, you can learn so much from this commentary. Chökyi Drakpa has brought together not only a tremendous amount of knowledge about the ngöndro practice, but also the wealth of experience that has been preserved in this unique oral lineage. I always keep a copy of this commentary with me wherever I travel. My students have made me a special edition in Tibetan and I carry it everywhere I go. I read through it again and again, but especially on important anniversaries and days dedicated to practice, going through it as I do each stage of the practice. By now I can read it very quickly because I have almost memorized it. It is always such a powerful reminder, and so inspiring. I remember the first time I showed it to my mother, who is herself a great practitioner of these teachings. She was so moved, she said, “You really don’t need any more than this; everything is here.” She is right. It is a genuinely precious gift for us all. It is the definitive commentary, and that is why I continue to teach from it, again and again." The colophon to the text gives the author simply as Chökyi Drakpa, without giving any time or place for its composition. We know from the content that it was written after the commentaries by Patrul Rinpoche and Jamyang Khyentse Wangpo, to which the author refers. We also know that he was sufficiently familiar with Gelugpa sources to quote from the Lama Chöpa practice in the Guru Yoga section. 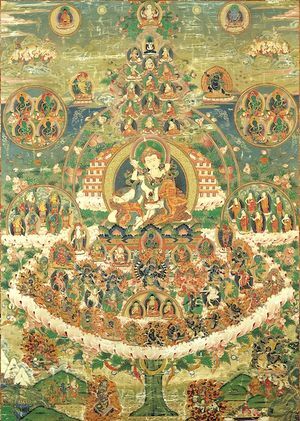 We can also see from his commentary on the lineage prayer in the same section that he was using a version which went down to the first Dodrupchen Rinpoche, Jikmé Trinlé Özer. There are several possible theories regarding the identity of the author. It has been said that he was none other than Thubten Chökyi Drakpa (aka Minyak Kunzang Sönam), an important student of Patrul Rinpoche, who wrote extensively on the Bodhicharyavatara. It has also been suggested that he was in fact Khenpo Kunpal, who was also known by the name of Kunzang Chökyi Drakpa, and used that name in his most famous work, his commentary on the Bodhicharyavatara. It is also possible that the author in question was one of the two disciples of Khenpo Shenga known as the "two Chödraks", i.e., Rahor Chödrak and Serkha Chödrak. The latter especially, who spent some time in Minyak, has been identified with this work. According to Anyen Rinpoche, the author was a lama called Ngatsé Chödrak (rNga/lNga rtse chos grags), whose monastery/hermitage called Nga-tse is near Mt. Minyak Gangkar. He might have been little bit younger than Kunzang Sönam and followed both the Kagyu and Nyingma traditions. This page was last edited on 28 September 2012, at 07:28.